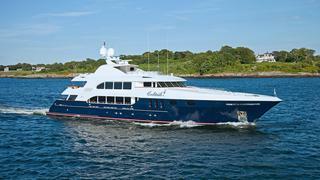 The 47.85 metre motor yacht Alessandra has been listed for sale by Josh Gulbranson at Fraser in Florida. Built in aluminium by US yard Trinity Yachts to ABS class, Alessandra was delivered in 2004 and went back to the yard for a multimillion dollar refit in 2012. The interior was completely restyled while the sundeck was also redesigned and the bulwarks on the main deck were cut down to improve the views out of the dining and main saloon areas. Accommodation is for up to 11 guests in five cabins including a main deck master suite while below there are two identical doubles to port and starboard, a further double and a twin with a Pullman berth, all with full en suite facilities. In addition, the port and starboard doubles have a removable wall and can be converted into one large suite – ideal for extended family voyages. The dining and main saloon areas of this yacht for sale were also completely reworked by the previous owner during the refit at Trinity. This space is now very open, connecting the dining area to the main saloon, creating a seamless flow which is perfect for entertaining. There are massive windows on the port and starboard sides flooding the saloon with light. The lounge space is very much a social gathering point, featuring comfortable furniture, a full service bar and two 55 inch television screens while the dining area forward is designed for 10 guests. The aft main deck on the port side features a full service bar and there is a central area with seating for eight guests, offering the perfect location for al fresco cocktails or dining. Moving up, the sky lounge is full beam with extremely large windows allowing plenty of natural light to enter the area. On the port side forward is a full service bar; while aft of the bar is a games table and on the starboard side is a writing desk, large L-shaped settee, two Ottomans and an occasional chair. On the forward bulkhead is a 55 inch television screen. Twin 2,250hp Caterpillar engines give her a range of 3,500 nautical miles at 12 knots and she is fitted with Quantum zero speed stabilizers. _Alessandra _ is asking $15,500,000.